Let me guess; you are excited. You are excited because you bought or were gifted your very first car. Or you have just moved to Austin, TX and cannot wait to start your new life over there. These are pretty exciting moments. However, before you can get your vehicle registered in Texas, this joy might be short lived. The state gives you only 30 days to register your car after you move to the state of Travis. It is also good to note that you can only apply for a driver's license after registering the vehicle. Well, no need to panic. 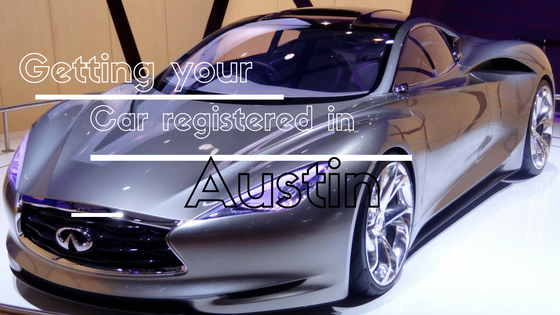 This article will tell you all that you need to know about vehicle registration in Austin, TX. Here is all that you should know. Before all else, make sure that you have insurance coverage for your car. This insurance is the comprehensive type that covers you, third parties and property. In terms of figures, this translates to a minimum of $30,000 per injured person and up to $60,000 for the same and $25,000 for damaged property. If you are coming from some States, your insurance coverage might be accepted. However, you must have the proper documentation for that and confirm with the state department the accepted coverage’s. You also must get your car inspected after which you are issued with a Vehicle Inspection Report (VIR). The inspector must be certified by the State Department of Public Safety. You can use the Department's locator to find a station near you. However, remember that most full service gas stations, dealerships and mechanics can inspect. The report that you get must have an original signature. After you have fulfilled the foregoing requirements, you can then go on with the initial registration. For this, you require the following documents; the proof of ownership and an approved identification. If you are registering through an attorney or in the name of an organization, business or trust, then you need some additional documentation. Accepted proofs of ownership include; original titles or the most recent registration receipt. Valid identifications include; U.S passports, U.S military identifications, U S citizenship and Immigration documents, foreign passports, driver's license issued by a U.S state or territory of the U.S and U.S department of state identification among others. You now must fill in the application for Certificate of Title (VTR 130-U). This will then be used to process your Texas license plates and registration sticker. I know what you are thinking. How much will it cost me? The charges depend on whether the vehicle is titled in your name or not, the vehicle weight and the assessment of the emissions. The total costs payable are divided into the following; new resident fee, title application fee, registration fee and state inspection fee if the vehicle is registered in your name. Visit the department in charge of vehicles registration in Austin for more insight about this. Well, there you have it folks! That's just about it for vehicle registration in Austin, TX. Remember that this article was about new vehicles. Look out for another one about the two-steps-one-sticker for registration renewal.